Our 24/7 IT Technical Support is Designed to Keep your IT Infrastructure up & Available Around-the-Clock. Remote Infrastructure Management (RIM) services provide end-to-end management and support of IT assets regardless of location by pro-active monitoring and analysis of events. Our Vision is to Provide End-to-End IT Technical Support, System & Network Administration in ITIL Model - Make Sure Your Business is Always Up & Running. We provide remote operation and administration services to desktop deployments and brings key service desk facilities to your workforce.Key service desk offerings such as incident, problem and change management, support user productivity. We perform remote infrastructure management and proactive round-the-clock monitoring of your servers. We track availability and utilisation of disk space, memory, network bandwidth and processing. Provide Executive Monthly Server Dashboard Report. We provide comprehensive support for your organization’s critical enterprise and hosted applications. We help your organization to reduce Total Cost of Ownership (TCO). We also provide improved governance of processes by leveraging ITIL compliant service delivery. We provide a robust set of services for the efficient management & secure operation of your storage infrastructure like RAID, LUN, Volumes & Storage Area Network configuration changes. We leverage storage capacity management to insure availability of resources for growth. We administrate your Firewall, Anti-Virus, Anti-Spam, Monitor performance & Software Updates. We provide security infrastructure managed to ensure the confidentiality, integrity and availability of your company’s assets, data, information and IT services. We provide a robust set of services for the efficient management and secure operation of your cloud infrastructure. Manage Cloud IT Infrastructure along with On-Premise Infrastructure. Manage Licensing & Scaling Cloud Resources up/down. We support tape and disk based backups (agent based) as well as tape rotation, restoration of data from tape and off- site storage and retrieval. We ensure regular backup, data protection and data recovery in the event of a system failure or an IT disaster. Our Remote Desktop Support services are designed to provide your business with full control and manage your IT infrastructure and network resources to achieve business growth and maintain high-quality performance by reducing operational costs.Seamless accessibility and smooth running of IT infrastructure provides a superior user-experience vital for business growth. Our Ticket Management system integrates all the tools necessary to ensure prompt and seamless resolution of customer inquiries. The more you automate, the more your service reps can focus on what is important – creating exceptional customer relationships. Our team of experts provide exceptional troubleshooting support in case of any type of system failure like servers, applications, end-user support etc. Our Incident Management team streamlines the process of restoring service following an unplanned disruption while minimizing impact to business operations and ensuring quality is maintained. We provide 24X7 maintenance, monitoring and support through global time zones for time critical applications.All services are provided to an agreed SLA. Our breadth of technical expertise and geographical reach will help your organization be more effective and respond faster to common IT issues without the need to add additional staff and overhead. We also provide offshore technical support services to firms who need to outsource their technical support services to India. Our Help Desk support services provide our customers with professional and immediate support without the costly overhead. Our help desk is fully-staffed by certified IT professionals who are available 24x7x365 via phone, email, web chat,skype or our secure web portal. Our L1 support includes services like Monitoring, Batch Scheduling, Batch Job Execution, Inventory Management, Software Upgradation, Distribution, Log Management. Our L2 support includes services like System Administration, Build, Maintenance & Patching, Upgrade & Software Distribution, Security Admin, Back up & Recovery. Our L3 support includes services like Technical Support & Problem Resolution, System Performance & Capacity Planning, Architecture/Design, Security Administration, Back up & Recovery. We follow ITIL Model through the use of the service lifecycle which comprises of 5 different phases namely Service Strategy, Service Design, Service Transition, Service Operation, Continual Service Improvement. 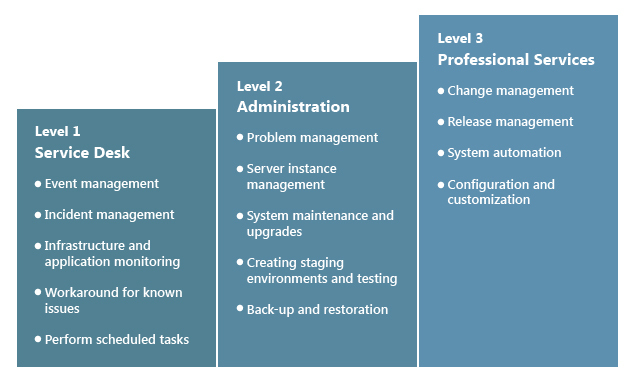 Escalation management is widely used for IT service management, and is also part of the ITIL recommendations.Using Escalation, Trackers can be configured so that issues that meet user-defined escalation criteria, that is issues that need extra attention, can be automatically flagged, so that they can become more visible in a timely fashion. The escalation trigger conditions and resulting actions are user-defined. A Ticketing System is better than many other methods of dealing with customer questions or reported issues. A Ticketing System, on the other hand, is specifically designed to organize issues as they are reported and keeps track of all fixes made, acting as an issue tracking system as well. We provide support on call and are available 24x7x365. We provide support through email and are available 24x7x365. We provide support through video call over skype and are available 24x7x365. We use Remote Desktop applications to provide support and are available 24x7x365. We also use WebEx for video conferencing, online meetings etc. and provide support through it and are available 24x7x365. We also use Goto Meeting for HD video conferencing and real time collaboration using which we provide support and are available 24x7x365. We use Teamviewer software to provide remote desktop support and are available 24x7x365.